Imagine (or remember) if you will…the 1950’s. Cars were hearty, Elvis dominated the radio, people attended sock hops, and the space race was just getting kicked off. America’s military was looking for a weapon to replace the venerable M1 Garand. Working for a company named ArmaLite, a brilliant inventor named Eugene Stoner created the AR-10 in the mid-1950s. The AR-10, if you aren’t familiar, is very similar in many ways to the AR-15. In fact, due to some interesting turns in history, the AR-10 led to the birth of the AR-15. 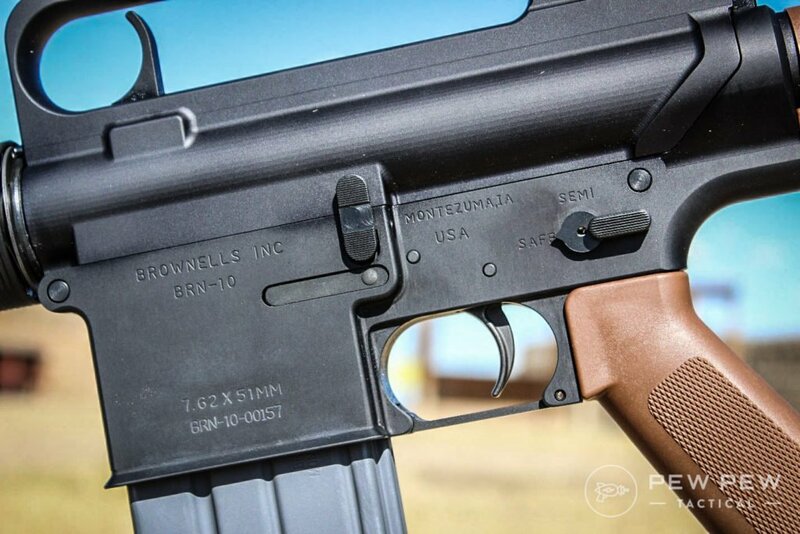 Fast forward to present day and we find the company Brownells has lovingly recreated the AR-10 in their Retro line of rifles—calling it the BRN-10. I had the chance to test one out at the range and review it. The weapon is a marvelous and functional piece of history and I’m happy to tell you why. The thing that comes to mind about the AR-10 is that they had a reputation for being unreliable. There is plenty of history out there but it is interesting how a reputation set, may not necessarily be deserved. With the U.S. Army looking for an alternative to the aging M1 Garand in the 1950s, several companies rushed to the competition. Stoner designed the AR-10 as a submission and things went well in the beginning. The rifle had several advantages over the Garand in that it had greater capacity, was lightweight, and fully automatic—redefining what a “machine gunner” had to lug around to be effective. Additionally, it was chambered in the 7.62×51 NATO or .308 Winchester with a 20 round, detachable box magazine. The AR-10 was staged to be a potent weapons system. An ill-fated decision over barrel materials caused the AR-10 to be scrubbed from consideration and based on that incident, the AR-10 never saw service with the U.S. Military. Poor barrel construction lead to a catastrophic failure of the AR-10 during U.S. Military Trials. Eventually, the AR-10 was retooled to work with the 5.56 caliber and labeled the AR-15. This evolution went on to become one of the most prolific assault rifles in the world. The AR-10 saw service in many countries after it was picked up by a Dutch company named Artillerie Inrichtingen. From there, many refinements ensued. Brownells has tapped into a lurking sub-market among the firearms community. There are those who have guns strictly because they are tools and serve specific functions like hunting, defense, etc. Some people own guns because they are heirlooms or they are collectible. Still, others have guns because they love them, and this includes a broad category of guns that look cool, have historic significance, or fall into some other niche or category. The BRN-10 checks a lot of these boxes. The front sight is elevated like the original, the front post is not adjustable. I took the BRN-10 out to the range with a few different ammunition types and I found myself amazed at its size. The box barely fit in the trunk of my Charger. In addition, I knew I would be hitting that 100-yard MOA with straight iron sights, no fancy optics here. 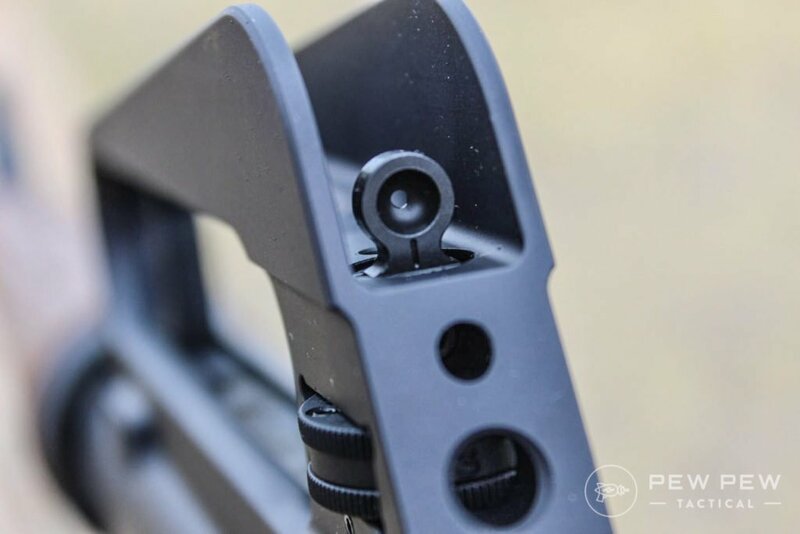 The rear sight has an elevation dial below. Hell, the gun doesn’t have a rail for mounting anything! It has a traditional carry handle on top of the milled receiver which also contains the rear sight. You look through this to find the front post sight. There is a plastic foreend, plastic pistol grip, and plastic buttstock, just like Stoner intended. The only thing you can mount on this baby is a strap, and maybe some good old-fashioned American gumption. I settled into my shooting bags and using three different types of ammo, prepared to see just how accurately I could shoot this big rifle. I started with Hornady American Gunner .308 155 gr BTHP and had a couple problems getting them from the magazine into the chamber. After I cleared this, the gun ran smoothly with every ammo type I used, including the Hornady. I also used Winchester 7.62 x 51 147 grain FMJ and Federal Premium .308 Sierra Matchking 168 grain BTHP. The results were impressive for this humble shooter. These rounds all hit in different areas (weights and velocities) but they each performed well. Despite some fairly serious cross-wind, my groups stayed in the 3-6 inch range. The velocities, measured on a Caldwell G2 Chronograph, demonstrated the benefits of the 20” barrel. Granted, each ammo type shot differently but I was able to adjust the rear sight and dial the rifle in. My groups, despite aging eyes, confirmed the rifle’s accuracy. One group shot with the Hornady dipped into the 2.75-inch range. I’ve no doubt a better shooter could pull tighter groups. The trigger felt like a single stage, averaging out at 4 pounds and 15.8 ounces on my Lyman digital gauge. With enough pressure built, the trigger just snaps, cleanly. I have not had the privilege of firing an original AR-10, but I have little doubt this is an improvement. I was able to select my target and press the trigger with accurate results. 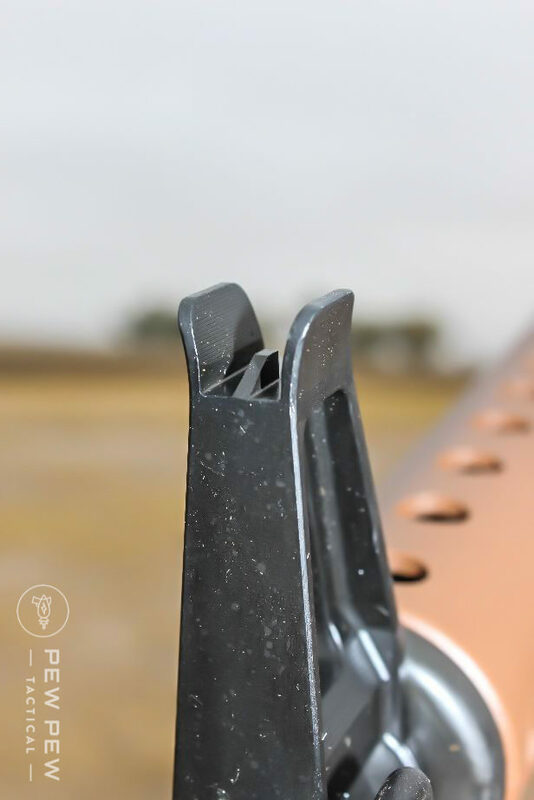 Something else noteworthy is the “trigger-style” charging handle. I really liked this although it makes the receiver handle a requirement. Due to the power of the .308 the spring is strong—you need to secure the weapon firmly to charge it, but the action becomes rote with practice. I was impressed with the accuracy of this rifle and although I’ve never been through basic training, I bet there are some shooters out there that could really make this thing sing. I had two strange failures to feed with the first two rounds but these cleared up afterward and never appeared again. While this was no long-term test, I fired close to 100 rounds through the rifle and had solid performance. This gun will likely go a long way toward healing the reputation of the original, whether fairly deserved or not. I hate to give this a lower rating because this gun comes from Brownells pre-customized! It is a 1950’s era, AR-10 remake, a historic (fully functional) replica if you will. 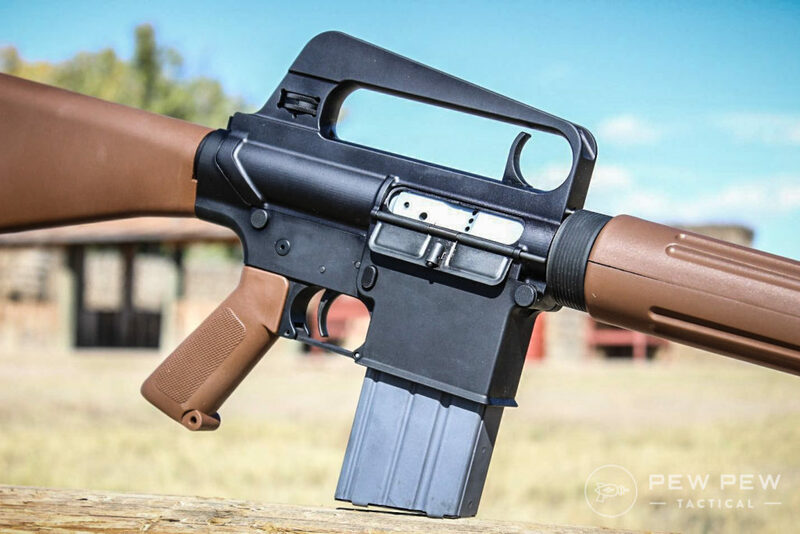 The only thing you could really customize on this gun is the strap and perhaps the magazine, though no one had heard of Magpul in 1955 so don’t try those magazines with this gun. This rifle hails from a time when we didn’t mount scopes, flashlights, or other geegaws to our guns—we simply picked them up and shot the enemy. Frankly, this is a gun you buy because you like it as is. If you get what the BRN-10 is about, it is truly beautiful. Remember, this shooter hails from the times when over-modulated announcers in television commercials promised the benefits of products using “space-aged polymers”. The clean lines, receiver handle, and charging “trigger” all bespeak an older era. Modern science promised to reap tons of benefits for the future. The BRN-10 encompasses all of that with this faithful rendition. The brown furniture BRN-10A comes in at $1,600 and is a close facsimile of the original AR-10. The black BRN-10B is priced at $1,700 and better matches the improved version later released by the Dutch. 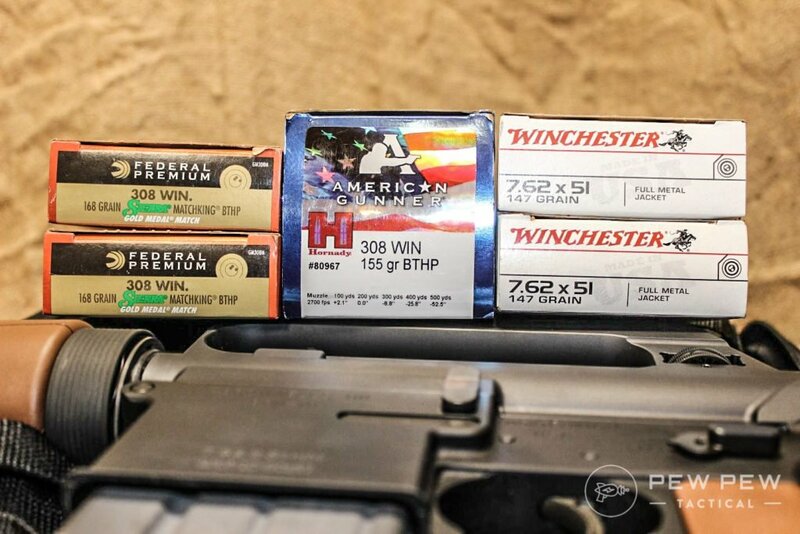 These prices are par for the course for a .308 semi-auto rifle of quality. 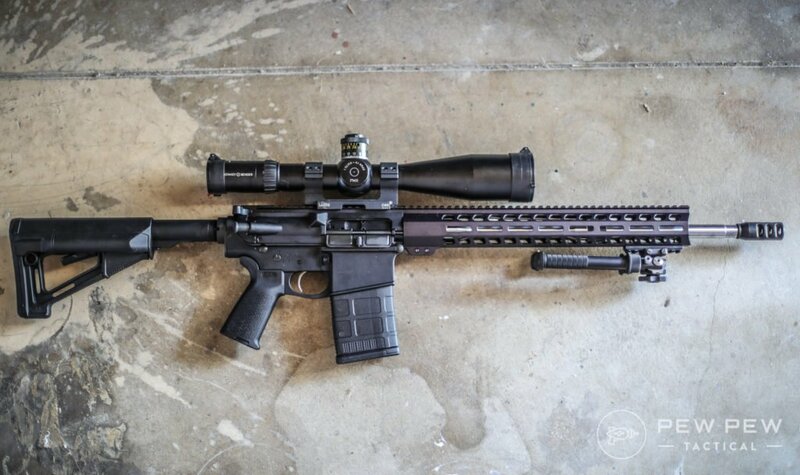 The BRN-10 is a wonderful way to look back in time and enjoy the original AR-10 as Eugene Stoner imagined it. This rifle is a collector’s item and, in that respect, offers a great deal of value to someone who cherishes this era of guns. However, it is also a fully functional rifle, mayhap, an improvement on the original with modern materials, treatments, and processes. These familiar controls are where the AR-15 pattern rifles got their start. The BRN-10 is a faithful reproduction that enjoys the benefits of the modern era using space-aged polymers and other materials. While this is not a purchase you make for your truck gun, or perhaps as your sole home defender, it can serve in those roles. Brownells has built-in accuracy and reliability to make it so much more than a collector’s item or relic of an older era—it is a modern weapon with 1950’s flair. What do you think about the BRN-10? Looking to get one? 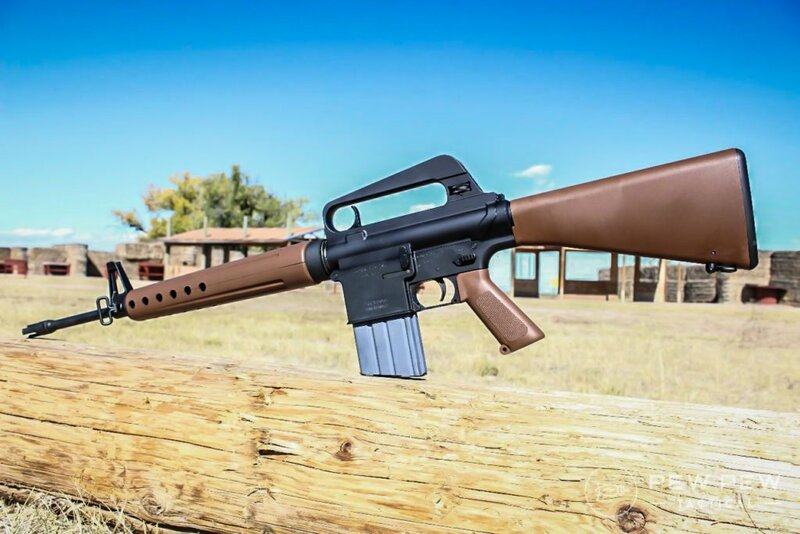 Or if you prefer something more modern…check out our Best AR-10s article. I bought one because i always wanted one but couldn’t afford them when the originals could be easily found at fun shows. It’s fun to shoot and i like the brown stock. I do, however, think the black stock version was cheaper than brown when i bought mine. JUST HAD A FLASHBACK OF BASIC TRAINING AT FT. BENNING.. THANKS FOR THE ARTICLE SEAN, ENJOYED IT.. Thanks for stopping by, and thank you for your service. 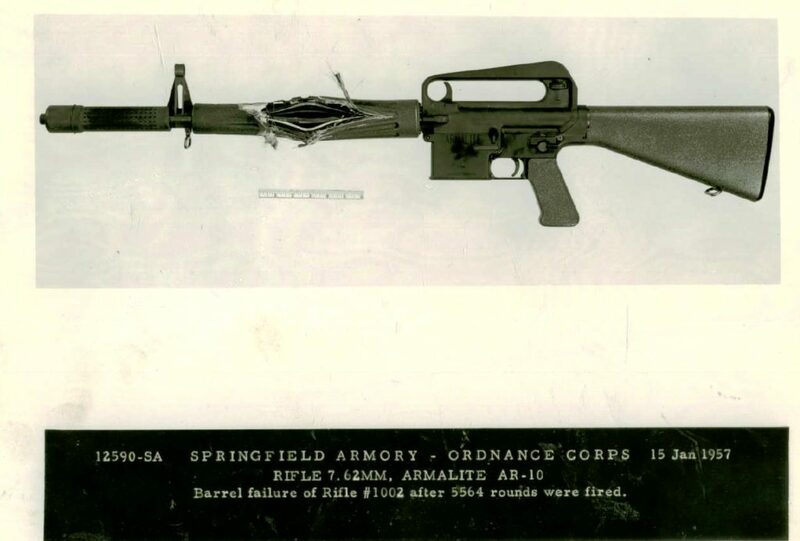 There was a reason the 3-pronged flash suppressor was re-made into a full ring on the M-16. Don’t try sneaking through the brush and expect it to fire with that barrel. Course, you wouldn’t need a bayonet!